The act of describing ones work, or more precisely the ideas behind it presents opportunities for how to pace your description. If we consider the typical novel, the author has certain expectations of how we, the reader might, encounter their work. More often than not sitting or laying down and dedicating a period of time of concentration to read the work. We can of course also consider the untypical novel, such as James Joyce's 'Ulysses'. In this the final chapter of the book has no punctuation. It forces the reader to change reading speed and create their own pauses and pacing. In terms of how this translates to printed language examples within design we can cast our vision back to the early 1990s and West Coast America. A certain David Carson. 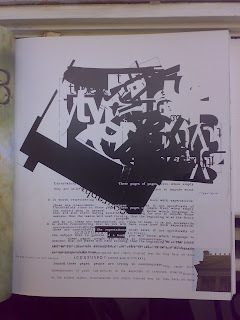 But how many of his immense army of fans realise just what he was attempting, behind the revolutionary graphic language?